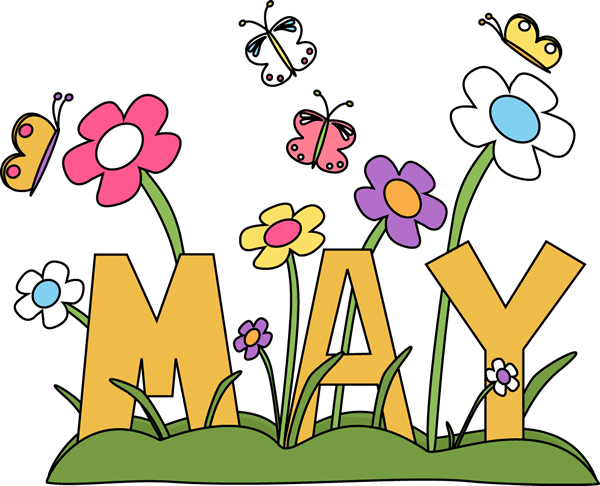 May is symbolic for me with Gardening, Family Birthdays and Mother’s Day – all of which translate to Flowers and Plants. Our presenter this month, Lizzie Matheson is a Floral Designer Extraordinaire. She will teach, enlighten and dazzle you with her tips, stories and designs. You will be awed with her floral creations and laugh along as she infuses her humour into each piece of art. 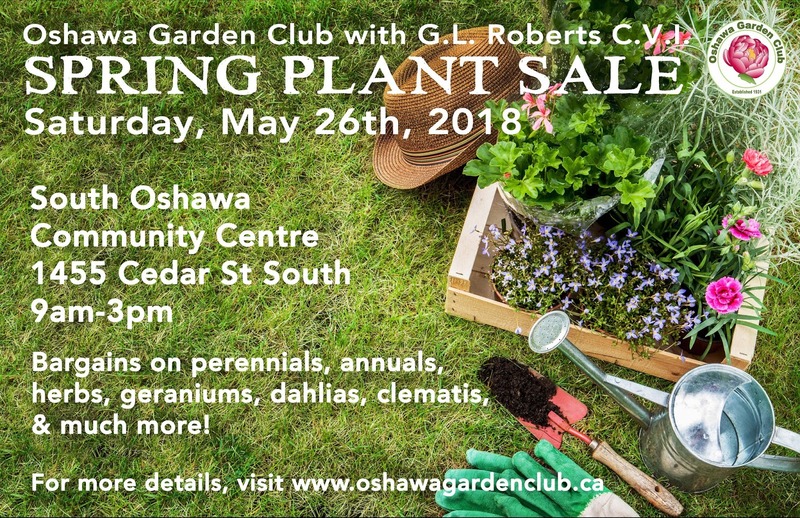 The Gardening Season is upon us and we are excited about our upcoming Plant Sale! You still have time to divide and donate a few perennials and we hope you will come with a friend and shop! 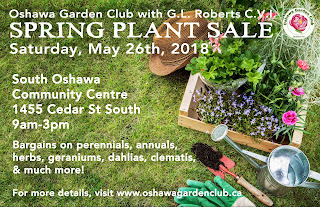 The Plant Sale is our main fundraiser and allows us to bring in quality speakers, subsidize social events, and support our youth and senior programs. Don't miss it! We have two new Board initiatives tonight. Every member will receive a coupon, in their name-tag tonight, to Bring-a-Guest to a fall meeting, free, one-time use. 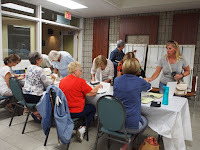 Also, starting at our Monday meeting, we will have a Volunteer Table, as our Garden Club is large and hopefully this will make it easier to ask about volunteer opportunities and find the sign-up sheets. 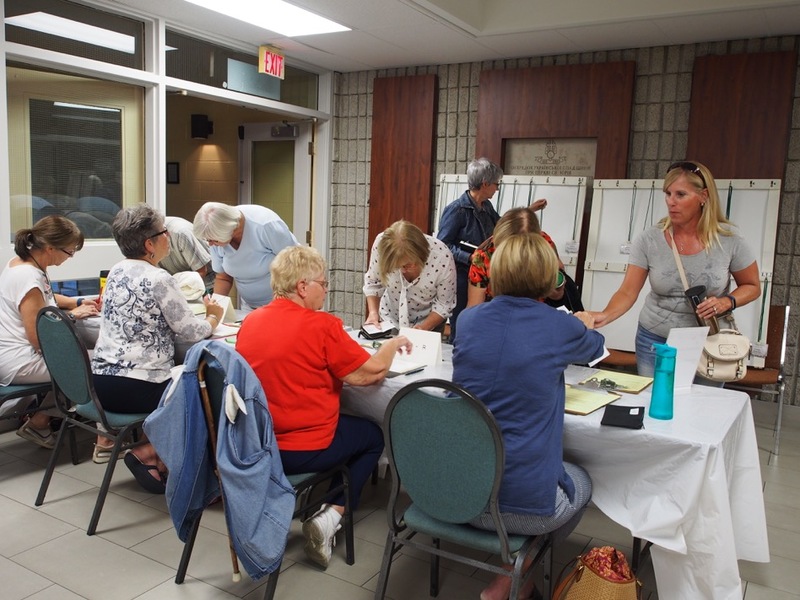 The Oshawa Garden Club Membership Year runs from September 1 until August 31. If you pay your Membership in June, your name will be entered into a draw to win a gift card from a local nursery! Help our volunteers by handing in your membership form and fee, as they can now prepare an up-to-date membership list, name tags, database, and garden centre discount cards before the busy fall season. Print the Form from our website or pick one up at the Sign-In table. 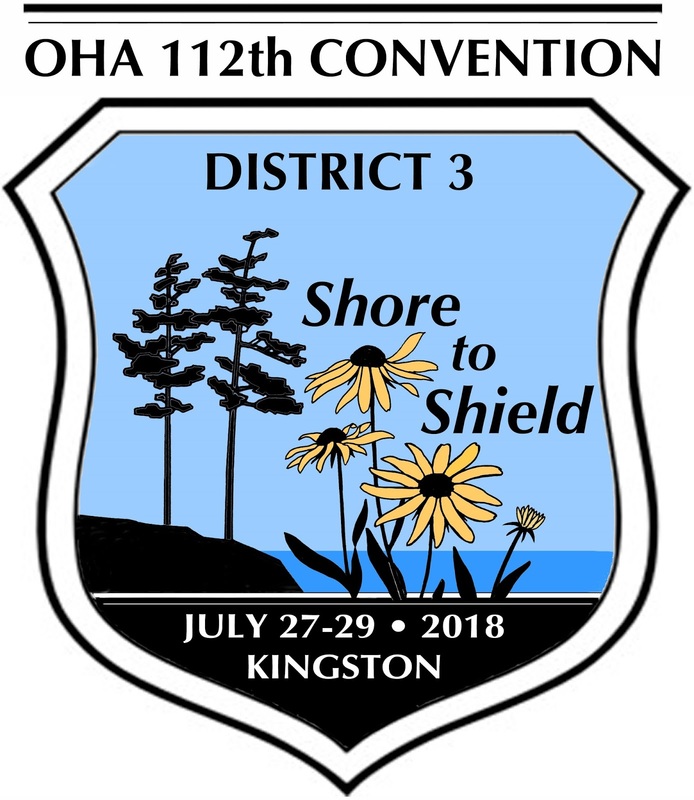 http://www.oshawagardenclub.ca/resources/Membership-form-2017.pdf Fill it out, attach your cheque made out to the Oshawa Garden Club and return it at the June meeting or mail to the address listed on the Form. Judy Jaeger is the Chair of the Plant Sale Committee and can answer any questions at the May meeting. If you have plants to donate, please drop them off at 8:00 am on the day of the sale. The committee has put up posters around town, but if you have a spot to advertise our sale, please pick up a poster at the May meeting. We have 88 lawn signs to be picked up at the May meeting, to be placed on your property, the Sunday before the sale. Return the sign at the June meeting. GL Roberts CVI School of Environmental Science is located by the scenic Pumphouse Marsh, just steps from Oshawa Creek and the Waterfront Trail. 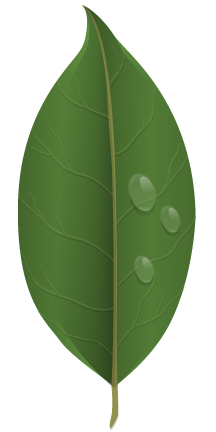 Unique to Durham and the province, the school offers environmental content in many courses leading to a Certificate of Environmental Studies. This is possible thanks to the support of the City of Oshawa, and General Motors of Canada. Two innovative courses are offered, Grade 11 Watershed Management and Grade 12 Industry and the Environment. The Horticulture Program focuses on landscaping and leads to college, university or apprenticeship opportunities. William Grainger, Head of the Science Department, is very knowledgeable about pelargoniums. (also known as annual geraniums) He breeds pelargoniums and he brings these sought-after, special varieties to our Sale. 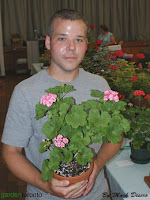 He is a member of the Geranium, Pelargonium & Fuchsia Society of Ontario. Chat him up at the Plant Sale...he is warm and friendly and knowledgeable! Sign-up tonight for a ticket for this FREE event. The Strawberry Social Committee is looking for new items (garden accessories, housewares) for a raffle at the Social. Please bring your donations to the May meeting or drop them off at LVIV Hall between 1pm and 2pm on the afternoon of the event, or if it is more convenient, we'll even accept your donations Monday evening. Purchase 10 raffle tickets for $5 and Good Luck! Does OGC work with Youth? Yes, we are holding a workshop during GardenOntario Week and we are looking for volunteers to assist with a Pollinator Activity for school-age children. The children will make a simple house for solitary bees. We have 6 volunteers, but children are busy and the more hands the merrier! Durham Boys and Girls Club, 433 Eulalie Avenue, Oshawa. Also, we do a small seed-planting activity with children at the Rose of Durham / Carea Community Health Centre Picnic. Memorial Park, Metcalf Street, downtown Oshawa by the Bandshell. Does OGC do any work in the Community? Yes, we tidy up the Hearth Place Gardens. The gardens are maintained by a service, but they need a little upkeep over the summer. The dates and times vary and volunteers receive an email with the details. Please join us and come when you are able. Dress for the weather and bring your choice weeding tool. It is fun. You meet other people. Bags are supplied. 9:45 am to approximately 11:00 am. Please join us for some or all of the sessions. Does OGC hold any workshops? Yes, our annual Bloomin' Oshawa Garden Crawl is popular! This is an informal, fun night out, to visit gardens, snap a few pictures and pick up some winning photography tips. Of course, we hope you will enter your photos in the 2019 Bookmark Contest. September is usually the deadline to submit and October is usually the popular vote by the Membership. Please join us. Would you like to show your garden? 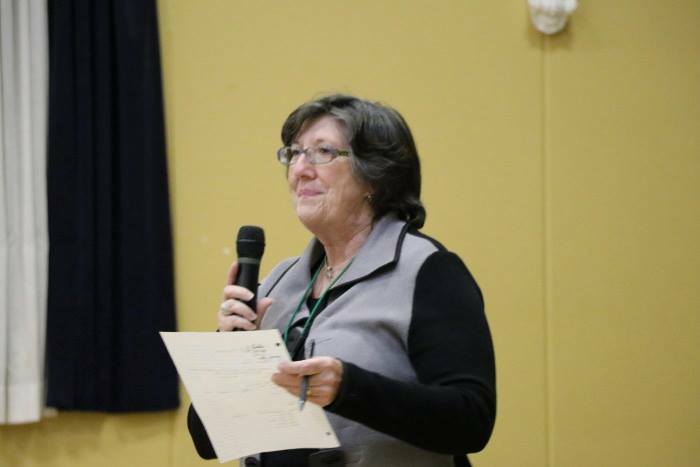 The Retired Teachers of Ontario are celebrating their 50th Anniversary this year. They are looking for Retired Teachers / Garden Club members interested in a Garden Tour, Tuesday, June 5, 2018. They are looking for private gardens in the Durham region. If you are interested in this event, l would love to connect with you at the May meeting. Would you like to show your Water Garden? The Water Garden Society is looking for gardens to show in the Oshawa area. See President Robin for the contact information if this interests you. There are three handouts this month, that can be picked up at the Volunteer Table. 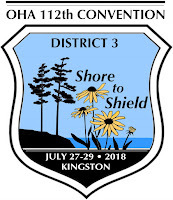 Registration Form for School for Exhibitors and Judges of Horticulture and Floral Design: This is for members who are interested in exhibiting and judging flower shows at garden clubs and OHA events. 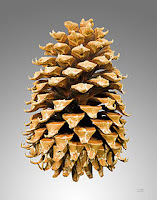 After 95 years, the Ontario Tree Seed Plant in Angus, ON will be closed. We are looking forward to an evening with Lizzie Matheson, a dynamic storyteller and floral arranger extraordinaire! The 50/50 draw is cancelled for this meeting. Instead, we are selling tickets for Lizzie's Spectacular Arrangements. We are also selling tickets for The Spring Basket. Tickets will be $3.00 each or 2 for $5.00. Thank you to the members that have brought plants, bulbs, seeds, books and more to the Plant Table over this past season. We depend on your generosity to keep the Plant Table well stocked and you have done a great job. There will NOT be a Plant Table at the June meeting. Lizzie's theme tonight is The Pleasure Is Mine. With this theme in mind, along with your own vision, create a floral arrangement for display at the meeting. There will NOT be an Imagination Station Table at the June meeting. 8 Garden Club volunteers did a spring clean-up of the Oshawa Valley Botanical Gardens during the Pitch-In Week. Wow! Thanks! 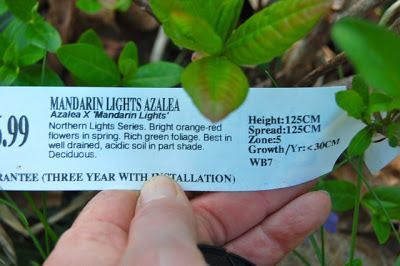 www.torontogardens.com recommends taking a photo of your plant tags. Keep your phone handy! For all the beginners in the group, the information on the plant tag is the key to successfully growing your new plant. Due to our harsh weather in early April, this gardening season is expected to be 2 weeks behind. Expect tropical plant stocks to be low, as Tropical Storm Irma took out many greenhouses in Florida this past fall and apparently, yellow hibiscus will be hard to find. Greenhouse growers are finding it more lucrative to grow pot than pansies!... leaving gardeners with fewer selections. Yikes! We had a beautiful day and a good turnout for our Annual General Meeting at Faith United Church in Courtice. Past President Suzanne Hanna represented GardenOntario and travelled from Sault Saint Marie. It was a full day with delicious treats and lunch and Speakers. Thank you to our hosts, the Bowmanville Horticultural Society, for starting off the gardening season with this inspirational day. Congratulations to Debi Foster, as she is now our District 17 Treasurer and will work alongside the District 17 Executive. Rick Causton is our District 17 Director. Registration is open to anyone interested in gardening. The Convention includes top-notch Speakers, bus tours, floral competitions, vendors, workshops and more. The best part is being surrounded by gardeners from novice to expert. Early registration is $150.00. 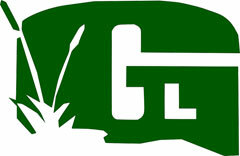 The registration form and other information can be found at www.gardenontario.org.